THIS Is How Much We Love You! We know you love it when we introduce you to Brisbane's best bars. And sources say that telling you about hot ways to spend a weeknight is also a win. So we thought we'd put our heads together, combine the two and bring you the coolest thing since… well… EVER! The Urban List is launching something new today, and we've got the happy squeals 'cause it's going to Change. Your. Life. Drumroll please. 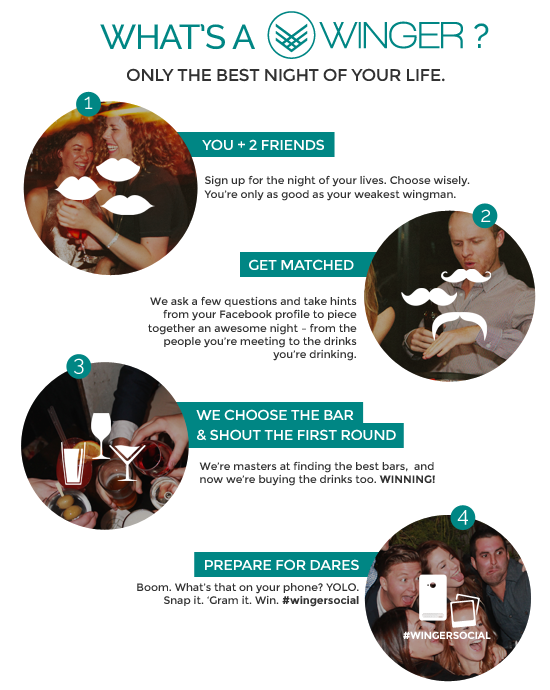 Introducing Winger Social – our new, invite-only social club. Hands down, the best way to spruce up your social (or love) life! Chances are, if you're currently single, you know that's it's rough out there in the big bad world of online dating. We know first hand – we've given it a shot and have decided trawling profiles for 'the one' is about as effective as standing on a street corner, pashing the nearest stranger, and hoping it all works out. Not a problem any more, Urban Listers, since you now get to head out to hot bars, with your besties, AND be introduced to your very own hand-selected babe buffet of potential mates! No creep factor. No #awkwardsilence. Surely that's a win? Winger is a brand spankin' new way to meet people. We know that can be tough if you can't find a common thread re where you went to high school. First round is on the house! Oh yeah! So basically, if you like fun, Winger is the answer to your party prayers. Oh, you're welcome. Not convinced? Seriously? We need to work on our persuasive skills…. Check it out anyway, and maybe even follow Winger on Facebook to see how the story unfolds. Maybe once you hear more about it you'll be keen to give it a go.